A number of days ago, I noticed a map on my bedroom wall. I have several maps in my room besides this one: a map of the world, a map of Middle-earth, and a map of Skyrim that was a gift from someone at work. This one, a map of Rovenia, was lurking above my window. I’d nearly forgotten it was there. What’s that? You’ve never heard of a place called Rovenia? Of course you haven’t, because I made it up. Rovenia was the setting for a novel titled The Trials of Lance Eliot, the first book of a planned trilogy. I published it about two years ago—a little less than a year after buying typewriter monkeys (what a mistake!) and starting this blog. Fifteen months later, I pronounced Lance Eliot dead. My short, stressed career as an author was ended. I may pick up The Eliot Papers sometime. Lance Eliot’s story is certainly one I want to finish. At the moment, however, I don’t think it’s terribly likely. I’m busy enough with work and blogging and all the responsibilities that come from being a grownup. 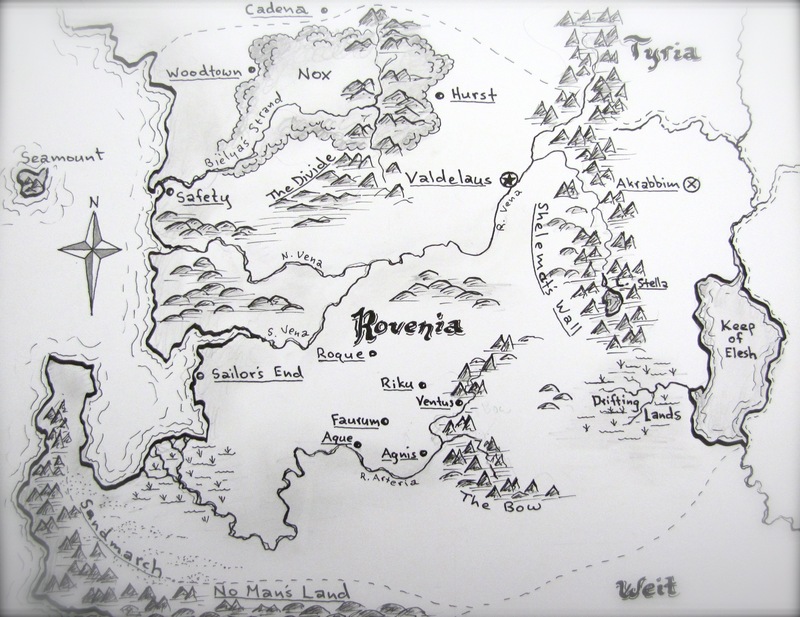 My map of Rovenia set me thinking about why I failed as an author. I came up with a few reasons, which I toss out today as friendly warnings to all the aspiring authors out there. Don’t make my mistakes. Learn from them, and rise to success! When I took my first few, tentative steps into the publishing industry, I had absolutely no idea of what I was doing. My ideas of what it meant to publish a book and be an author were hopelessly naïve. A little research would have saved me a lot of time, effort, and discouragement. When I began working on The Eliot Papers, I had the romantic notion of using a pen name. It was part of an elaborate frame story for the novels, in which Lance Eliot’s “memoirs” were “discovered” by an “editor,” who published them in the guise of fiction. It wasn’t a terrible idea—Lemony Snicket did pretty much the same thing—but it had one fatal flaw. Without a major publisher to market my book for me, I had to use my real name to promote it. Using both a real identity and an assumed one during the book’s release was a headache, and probably confused people. Oh, how I tried to promote The Trials of Lance Eliot. It had its own blog. I had an author page on Facebook and account on Goodreads. Readers submitted reviews, which I shared. It wasn’t enough. Looking back, I realize I should have done more: book blog tours, giveaways, submitting the book to more reviewers, and perhaps even setting up readings in the local library. As I worked on the manuscripts for The Eliot Papers, I expected way too much of myself. I set impossible deadlines and tried to juggle my book, this blog, a full-time job, and a handful of other projects. There was no way I could do it all. When I published The Trials of Lance Eliot, I had written a few chapters of its sequel. Those chapters are pretty much all I have written. After the first book came out, I was far too busy promoting it and writing this blog to work on a sequel. I should have finished, or at least nearly finished, my manuscripts for the entire trilogy before publishing the first part. It would have allowed me to market the book without diverting some of my time and energy to its sequels. It was a mistake to think I could make steady progress on a book and a blog. This blog has deadlines. My book didn’t. Guess which one was neglected! I also dabbled in a few other personal projects, none of which succeeded. Those could have waited—the book should have taken priority. I blame my monkeys for all of my failures. All of them. Do I regret trying to be an author? No. What I regret is doing it so badly. All the same, the years I put into writing and publishing The Eliot Papers gave me much invaluable experience as a writer and editor. It also taught me lessons about managing my time, setting reasonable goals, and enjoying creativity for its own sake. If any of my dear readers are writing books or hoping to become authors, keep going! Don’t give up! Just don’t make my mistakes… and don’t ever buy typewriter monkeys. This entry was posted in Writing and tagged personal, The Trials of Lance Eliot, typewriter monkeys by Adam Stück. Bookmark the permalink. Nothing is ever a failure until you quit; this is an easy thing to say. It is also true. You are in a great position now. Now you do have experience. You have one book under your belt, and the start of another on your plate. I envy you. I understand the reluctance to take up the unexquisite agony of creation again. The road seems long and the obstacles hard and the outcome doubtful. But if you are a writer (and I think you are, a real writer) you’ll take it up again. Fifteen years ago I finally completed a book by the method of writing a single page a day, and when I didn’t have the energy, just a paragraph. My only regret since I finished it is that I have been a bad parent, unable or unwilling to take the trouble to get it published. Again, I envy you. If you have faith in your Lance Eliot, write it, even if it never sees publication. Why must a daisy fight the entire Universe just to be born and bloom? It hardly seems fair, but then the trials of a hero seldom do. And you can see daisies popping out through concrete, everywhere. I appreciate your comment, and I hope someday to return to the story of Lance Eliot. For now, there are several reasons for my reluctance to pick up that story again. Writing fiction — any kind of fiction — has been harder lately. I struggle as it is to keep up with this blog. Finally, and most significantly, I’ve realized Lance Eliot’s story may not be all that great. It has more flaws and cliches than I realized at first, and my style isn’t terribly good. The staggering effort of writing books, complicated by all the trials and challenges of a busy life, doesn’t seem worth it. We’ll see whether Lance Eliot finishes his journey. Thanks for chiming in!